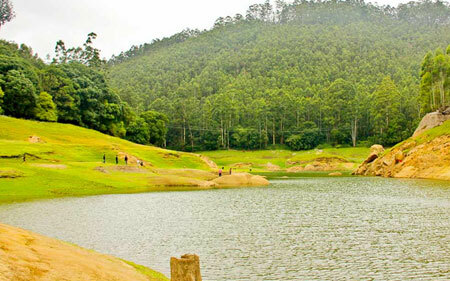 It is 20 kms away from Munnar. En - route top station, at a site on the lake bank, between some hills,every loud sound or hum is echoed many times by the surrounding hills. This spot is famous as the Echo point encased with panoramic sights. The place serves as an excellent place, particularly for young visitors to go ashore for a while,yell out as well as listen to their own voice echoing. Top Station : It is about 41 kms away from Munnar. This place is the major home to the highest tea - plantations of India. From Munnar it takes about 1 hr to reach. Top Station is situated on the borders of Kerala and Tamil Nadu and speaks a supreme panoramic sight. Visitors keep exploring the top station as it is cited in Tamil Nadu's Theni district and Kerala's Idukki district. The place is located at an elevation of 1700 meters.